As a result, the Interstate Highway system forms a grid with numerical designations increasing gradually from low to high – both from west to east and south to north. Interstate Highways were numbered so that they would not conflict with the preexisting U.S. Numbered System; additionally the intent was that no Interstate Highway and U.S. Route would share the same number within the same state. I-24 and U.S. 24 currently both exist in Illinois. Plans for extensions to I-49, I-69, and I-74 will result in those routes meeting and intersecting their U.S. Highway counterparts. Interstate 50 and Interstate 60 were not assigned so as to avoid conflicts with U.S. 50 and U.S. 60 in the central part of the country. Some Interstate Highways are Unsigned, including a variety of spur and loop routes that are often superfluous or confusing designations in addition to the primary route number. Full 360-degree beltways include I-270 OH, I-275 KY/OH/IN, I-285 GA, I-410 TX, I-465 IN, I-495 MD/VA, I-610 TX, I-695 MD. I-275 in KY, IN, and OH is the only three-digit Interstate currently to serve three states. I-495 (Capital Beltway) serves Virginia and Maryland, but a portion of the route passes through the District of Columbia while crossing the Potomac River at the Woodrow Wilson Bridge. I-271 and I-480 merge together briefly east of Cleveland, marking the only location where two three-digit Interstate routes merge together. The following routes have an even first digit but do not end at another Interstate highway on one end: I-264 VA, I-295 NY, I-478 NY, I-495 NY, I-678 NY, I-635 TX, I-878 NY. I-238 in CA acts as a spur of I-80, connecting I-880 and I-580 in the San Francisco Bay Area. At the time it was commissioned, no more I-x80 route numbers were available for use, so the designation of adjacent CA 238 was used to number I-238. Some even-prefixed three-digit routes serve states that are not served by their parents, including I-275 OH/KY/IN and I-287 NJ/NY. I-585 in SC does not connect to its parent (I-85) currently; it begins at Business Loop I-85 and ends in Downtown Spartanburg. The following routes are examples of intercity routes, acting in a regional capacity: I-380 PA, I-385 SC, I-505 CA. Some odd-prefixed three-digit routes serve states that are not served by their parents, including I-129 NE/IA and I-535 MN/WI. Some Interstates have state route extensions, including I-15 in San Diego (continues as CA 15), I-265 in New Albany (continues as IN 265), I-381 in Bristol (continues as VA 381), I-481 in Syracuse (continues as NY 481), I-690 in Syracuse (continues as NY 690), and I-794 in Milwaukee (continues as WI 794/Lake Parkway). Some proposed future Interstate corridors have state route designations, or were previously numbered as such. Some examples include I-840 near Nashville and CA 905 in San Diego. Still other state routes have numbers that may make it look like a future Interstate corridor but are not, including VT 191 in Newport and IL 394 near Chicago Heights. Four state capitals are not served by the Interstate Highway System as of 2006: Juneau, Alaska; Dover, Delaware; Jefferson City, Missouri; and Pierre, South Dakota. It is not true that one mile of every five miles of Interstate highway must be straight enough to allow planes to land on it. This is an urban legend. With one exception (I-65), Interstate 64 overlaps with every two-digit interstate it meets from Wentzville, Missouri to Hampton Roads, Virginia. I-64 merges with I-70, I-55, I-57, I-71, I-75, I-77, I-81 and I-95. "Timeline outlines Montana Department of Transportation history." Montana Standard, June 16, 2013. Access must be controlled, with points of entry limited to interchanges with grade separation. (There are several exceptions to this rule.) Interchanges should be spaced one mile apart in urban areas and three miles apart in rural areas. All overpasses must have a 16.5-foot vertical clearance above the freeway, although 14-foot overpasses may be permissible within urban areas. This particular specification was created to allow for military apparatus (such as the huge atomic cannon) to pass cleanly under an overpass. Although military equipment of this size is not commonly transported on the Interstate Highway System (and the atomic cannon is no longer in use), the standard remains. If an overpass cannot be upgraded to accommodate 16.5 feet, then there must be exit and re-entry ramps that allow high profile vehicles to leave the freeway and rejoin the freeway on the other side of the overpass. Truss bridges and overhead signs must meet or exceed 17 feet. Standards may be reduced somewhat for tunnels or other long underpasses. Interstates must be constructed with at least two 12-foot lanes of traffic in each direction. If level of service requirements specify additional lanes for the particular section of freeway, then those additional lanes become part of the standards (standard since 1966). Right shoulders must be at least 10 feet wide; left shoulders must be at least four feet wide. Median width should be 36 feet in rural areas and 10 feet in mountainous or urban areas. Guardrail or jersey curb (K-rail) may be placed between lanes of traffic to reduce the required width of urban Interstate highways. Vertical curbs are prohibited unless they are at the edge of the right shoulder and are sloping in nature (no more than four inches tall). Design speed should generally be 70 miles per hour, with 60 miles per hour sections allowed in hilly terrain and 50 miles per hour sections allowed in urban areas or within mountainous regions. Maximum grade is six percent, with certain exceptions allowed in mountainous regions. Interstates are generally open to all traffic, unless a specific waiver exempting certain vehicles is granted. At-grade railroad crossings are not permitted on the Interstate Highway System (standard since 1966). All of this information may be found in detail in the American Association of State Highway and Transportation Organization (AASHTO) publication “A Policy on Design Standards – Interstate System.” It contains much more detail and explanation on these design standards commonly referred to as Interstate standards. These standards are also summarized on the webpage Celebrating the 50th Anniversary of the Eisenhower Interstate Highway System: Previous Interstate Facts of the Day by the Federal Highway Administration (FHWA) – see the dates April 11-14, 2006. There are plenty of exceptions to Interstate standards found on the existing system, some of which were allowed into the system despite the deficiencies. Other routes were added with a waiver on a certain standard. 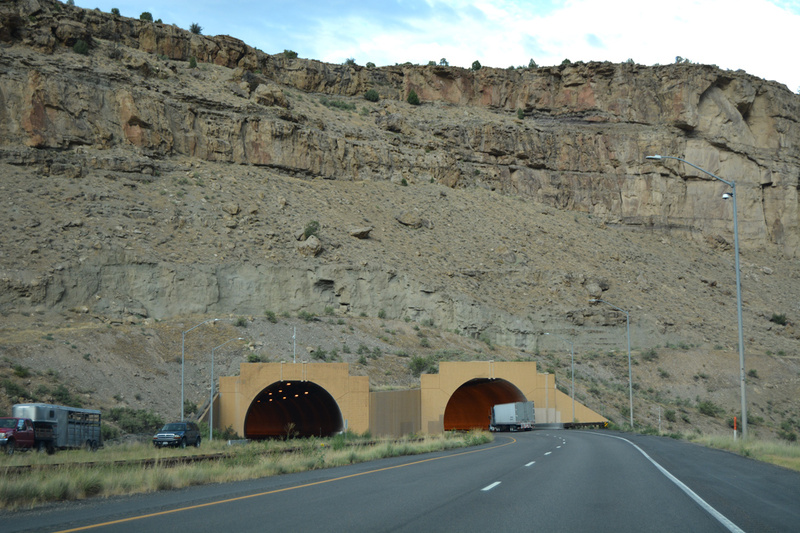 The Beavertail Tunnel, in De Beque Canyon, is the first of five eastbound tunnels along Interstate 70 across the state of Colorado. Photo taken 08/10/16. I-70 in Breezewood, Pennsylvania – to make the connection from I-70 to the Pennsylvania Turnpike, through traffic must use U.S. 30 through Breezewood, passing through several signalized intersections before returning to controlled access freeway. I-78 in Jersey City, New Jersey – between the western end of the New Jersey Turnpike Extension and the entrance to the Holland Tunnel, I-78 passes through several signalized intersections. I-180 in Cheyenne, Wyoming – the entire route is at-grade expressway with five signalized intersections: two at I-80, two at city streets, and one at Business Loop I-80. I-585 in Spartanburg, South Carolina – the section between Business Loop I-85 and I-85 is at-grade; the southern end has a few traffic signals north of U.S. 29, even though the I-585 signs continue south to the U.S. 29 intersection. I-676 in Philadelphia, Pennsylvania – the through connection between the Benjamin Franklin Bridge and the Vine Street Expressway requires passage through one traffic signal.